When Ryan Braun accepted a sixty-five-game suspension for his violation of MLB’s drug policy, I lit into the Milwaukee Brewers star, or at least did whatever constitutes lighting into someone around here. 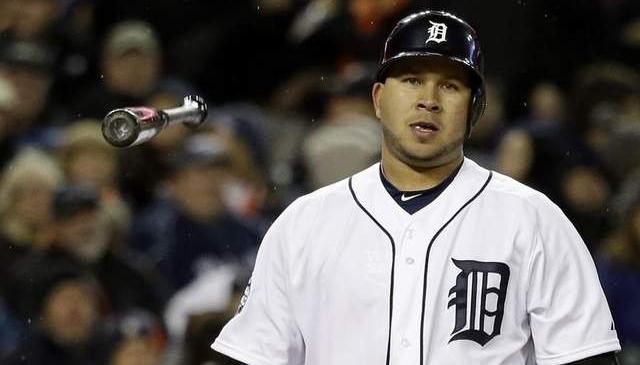 Now that (likely former) Tigers shortstop Jhonny Peralta has accepted a fifty-game suspension for his connection to the Biogenesis clinic, it seemed only fair that I respond to a part of this expanded story that hits close to my fandom as well. Peralta represents the nearest the PED scourge has come to my fan doorstep– right on the front stoop, as it were– and even though I acknowledged the likely cognitive bias in the abstract, I did not really appreciate how differently one approaches stories like this when they directly involve a favorite team or player until the Peralta suspension was announced Monday. Lance Armstrong was fun, but I wasn’t a real cycling fan and I never wore a Livestrong bracelet. I wasn’t a fan of Barry Bonds or Roger Clemens either. I did have plenty of pictures of Mark McGwire and Sammy Sosa on my bedroom walls as a kid, but the revelations didn’t come as quickly then as they do now. By the time they came for those two, I’d moved on. When the PED dragnet picked up an active Detroit Tiger, a starter, an all-star, and an important component of a team with World Series aspirations, though, I found myself scrutinizing every word of the official public statements in the matter, demanding concrete proof of wrongdoing, and generally establishing a defensive posture. Peralta was reported to have a weaker connection to the Biogenesis clinic than other accused players, after all, and didn’t MLB strongarm Biogenesis founder Anthony Bosch into “cooperating” with the league’s investigation by filing a probably frivolous lawsuit against him (yes), and have there been any positive drug test results for any of these players (no), and aren’t they kind of being railroaded into accepting these no-contest suspensions (I mean, at least kind of), and isn’t there something to be said for due process in all of this (of course), and what did the league and the players say, exactly, anyway? In spring of 2012, I made a terrible mistake that I deeply regret. I apologize to everyone that I have hurt as a result of my mistake, including my teammates, the Tigers’ organization, the great fans in Detroit, Major League Baseball, and my family. I take full responsibility for my actions, have no excuses for my lapse in judgment, and I accept my suspension. I love the fans, my teammates and this organization, and my greatest punishment is knowing that I have let so many good people down. I promise to do everything possible to try and earn back the respect that I have lost. Major League Baseball has worked diligently with the Players Association for more than a decade to make our Joint Drug Program the best in all of professional sports. I am proud of the comprehensive nature of our efforts – not only with regard to random testing, groundbreaking blood testing for human Growth Hormone and one of the most significant longitudinal profiling programs in the world, but also our investigative capabilities, which proved vital to the Biogenesis case. Upon learning that players were linked to the use of performance-enhancing drugs, we vigorously pursued evidence that linked those individuals to violations of our Program. We conducted a thorough, aggressive investigation guided by facts so that we could justly enforce our rules. Despite the challenges this situation has created during a great season on the field, we pursued this matter because it was not only the right thing to do, but the only thing to do. For weeks, I have noted the many players throughout the game who have strongly voiced their support on this issue, and I thank them for it. I appreciate the unwavering support of our owners and club personnel, who share my ardent desire to address this situation appropriately. I am also grateful to the Professional Baseball Athletic Trainers Society and our club physicians, who were instrumental in the banning of amphetamines and whose expertise remains invaluable to me. As an institution, we have made unprecedented strides together. It is important to point out that 16,000 total urine and blood tests were conducted on players worldwide under MLB Drug Programs in 2012. With the important additions of the hGH testing and longitudinal profiling this season, we are more confident than ever in the effectiveness of the testing program. Those players who have violated the Program have created scrutiny for the vast majority of our players, who play the game the right way. This case resoundingly illustrates that the strength of our Program is not limited only to testing. We continue to attack this issue on every front – from science and research, to education and awareness, to fact-finding and investigative skills. Major League Baseball is proud of the enormous progress we have made, and we look forward to working with the players to make the penalties for violations of the Drug Program even more stringent and a stronger deterrent. As a social institution with enormous social responsibilities, Baseball must do everything it can to maintain integrity, fairness and a level playing field. We are committed to working together with players to reiterate that performance-enhancing drugs will not be tolerated in our game. Peralta’s statement is a contrite apology, but he admits nothing specific– namely, actual use of performance-enhancing drugs. For those looking for a smoking gun, that paragraph– which places “those players” right after a blanket statement about drug testing– is the best Selig can do. Why can’t anyone close the loop? There are lots of people out there in favor of these suspensions, saying that fifty games is a fair punishment for having one’s name listed among the documents of Tony Bosch. What these documents are and what exactly they say we can’t be totally sure. However, one thing we do know is this: as of right now, the MLB has not presented any failed drug tests for the players in Bosch’s records. Therefore, it is my opinion that these suspensions are unfounded and unfair. Now, let me be clear. It’s very likely that Jhonny Peralta did, in fact, use banned substances that he obtained from Biogenesis. If that’s true, then he is in clear violation of the rules of MLB, and a fifty-game punishment would, in fact, be just and right. He probably cheated, and that’s definitely not okay. But, there are a few problems. … Without a positive test, there is no actual proof that a player used PEDs. In other words, having one’s name in the documents of the sketchy owner of a now-defunct clinic should not be enough to have a player suspended. In the end, my allegiance is to the team. Thankfully, the team was able to find some measure of a replacement prior to August 1, but Peralta’s absence will hurt the team, and I don’t like that. This team has faced and is continuing to face plenty of challenges this season, though, and this feels like little more than another drop in that bucket right now. Everyone had plenty of warning that this probably was going to happen, so I’m not feeling any anger or shock our outrage at Peralta himself, as might follow a sudden reveal. I am a bit sad, though, because my gal, a newer baseball enthusiast, had pegged Jhonny as one of her favorites, and this goes right at the enjoyment of the game I share with her. This entry was posted in ALDLAND and tagged anthony bosch, biogenesis, bud selig, detroit, drugs, jhonny peralta, jose iglesias, mlb, ryan braun, sports illustrated, tigers by AD. Bookmark the permalink. Well said. Obviously, it’s hard to replace a bat like Peralta’s, but the addition of Iglesias certainly bodes well for the future. It’s one of those things — if Peralta hadn’t gotten suspended, the Tigers likely would never have landed Iglesias, a guy who will probably be one of the best defensive shortstops in the league for many, many years. Win some, lose some. Thanks. I think you’re definitely right about the future. Peralta was done as a Tiger anyway. Sometimes hastening those decisions isn’t always a good thing, though, particularly on a team that’s built (and financed) to win now. I’m happy they got Iglesias, and I don’t think the Peralta suspension is a crippling blow, but I do wish it wasn’t something they had to deal with. It’s not just Leyland. The coaches meet in his office.